Dr. Sudoku a.k.a. Thomas Snyder is going to be contributing a super, super-sized logic puzzle to the Year of Puzzles. In case you're wondering, Thomas definitely has creds. He's a six-time winner of the US Puzzle Championship, most recently in 2012, where he set a new record for the highest point+bonus total. He's also a three-time World Sudoku Champion. And, if that isn't enough, he's the founder of Grandmaster Puzzles (gmpuzzles.com), which specializes in hand-crafted logic puzzles. Thomas gave us a small TomTom puzzle for the free mini puzzlehunt. It's not accidental that the numbers in the top two rows match our original goal of $9,973 and our stretch goal of $16,993. That's the sort of attention to detail we love to see in puzzle authors. Each row and column contains the numbers from 1 to 5, with no repeats. The puzzle is divided into cages (the dark bordered areas). Each cage has a target, which is a number and an operator. The target number is either the sum, difference, or product of the numbers in the cage. For example, a target of 4x means that the product of the numbers that go in the cage's cells is 4. Use logic and process of elimination to determine the numbers. 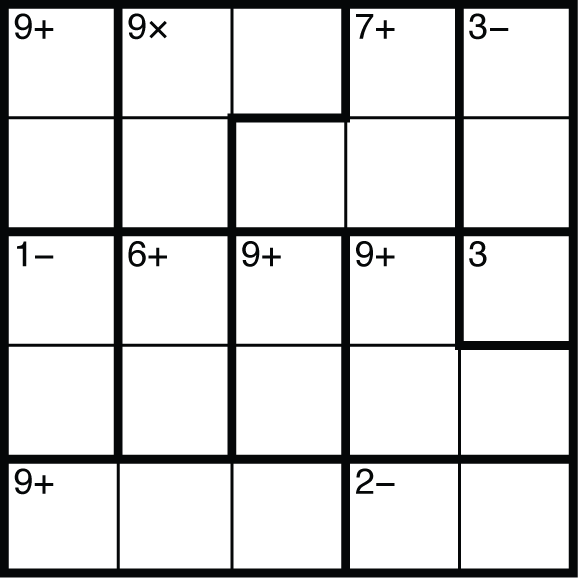 When you're done with the puzzle, Dr. Sudoku likes to ask the question: What's the bottom line? You can view all updates, including those that were sent out before you pledged, by visiting the project on the Kickstarter web site. Click on the Updates link right below the title. There are also links to Comments and a list of project Backers. Once we post an update, we can't change it (except within the first few minutes to correct errors), so don't worry about rereading updates you've already read. However, we can change the main page, and we have done so to talk about the new stretch goals, and to update the puzzle summary at the bottom as we add puzzles. Your credit card will not be charged until the project closes, at 8PM Pacific Time on Wednesday, January 23, 2013. Wednesday is also the last opportunity to pledge to the campaign. While it won't be the last opportunity to subscribe to the Year of Puzzles, it will be the last opportunity to get those rewards we've said are exclusive to Kickstarter. Puzzazz launched two new puzzle ebooks in December. Out of Left Field by Kosman and Picciotto collects 20 great cryptic crossword from The Nation while Off the Beaten Path with Virgilius has 20 variety crosswords by British author Brian Greer. (Learn more here). See earlier updates for more information. Don't forget that numbers you don't know what to do with might be indexes into words or phrases. In the crossword, 17 Across is the name of a song with enumeration (5, 2, 8). It's not cheating to ask for a hint. Send us a private message on Kickstarter or http://www.puzzazz.com/contact if you want a hint.